What is one thing you can “see” in a different way than you ever have before? For example, there is this little area in our living room that has kind of morphed into what some might call an alter of sorts. Two different people had given me Ganesh statuettes that ended up on the marble stand that used to hold up a water fountain. Because that area has always been hidden in an unlit area, when a friend gave me a salt light, naturally I put it up there too. And then, of course when my husband brought home three of those tall candles with religious icon decorations all over them (instead of something basic like vanilla) I put those next too the stand. Over the years, we’ve ended up with interesting rocks from various trips abroad and a couple of petrified coral…so they fit perfectly in the little cave-womb of the stand along with another candle in its own little case that refracted the light nicely off the inside when lit. It has occurred to me more than once, that some of my “less-than-open-minded” friends and acquaintances that have visited our humble abode may have wondered, almost feared the altar area of the living room but I quickly put that aside knowing that this area was really art-in-the-making for me. Fast forward to a weekend of thorough house cleaning. 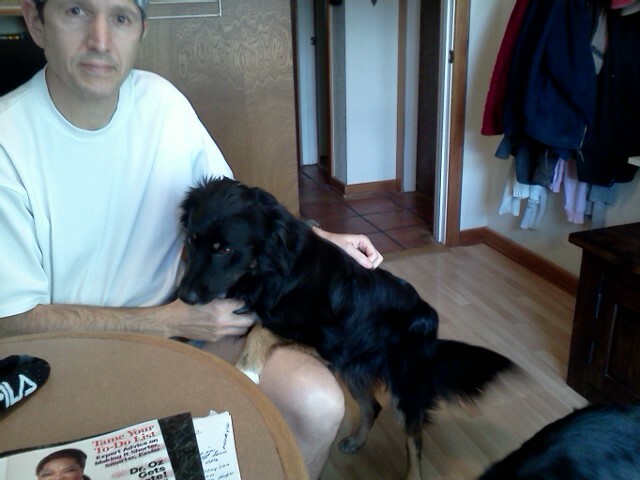 Happened to have George, our Border collie and Paul, our Aussie-Shep, keeping me company while I cleaned. I noticed when I got to the alter area and pulled out all the rocks and candles to dust thoroughly that, George, was watching the whole process intently and being as how it is in the genes of these two dogs to pay attention to everything in their environment, I didn’t give it too much heed. Later that evening as my husband and I were settling in to watch an episode of our favorite TV show, David noticed that one of the rocks from the “sacred pile” was almost purposefully sitting all by itself about two inches from the others on our living room floor. We chuckled at the oddity of it and went back to watching our show. After the show, David looked back over to the alter area and, sure enough, there was not just one rock two inches out from the others, but four very carefully moved rocks set out from the rest. Now, I’m not sure exactly what was going on in George’s mind when he moved the rocks except that he does love to chew on rocks and stick, but I do know that he must have thought there was something pretty darn special about those particular “alter” rocks which left me to conclude that if my dog knows enough to treat this area and all its content with reverence then perhaps I should as well. Today I’m claiming my “God spot”, rocks and all. Thank you George, for helping me to see something a little differently that was right in front of me all this time.